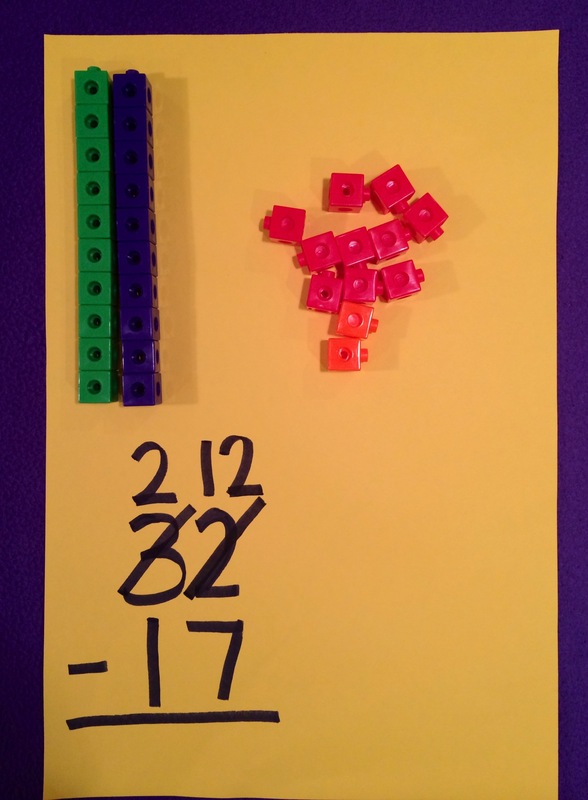 I’m officially trading in my place value blocks for unifix cubes! 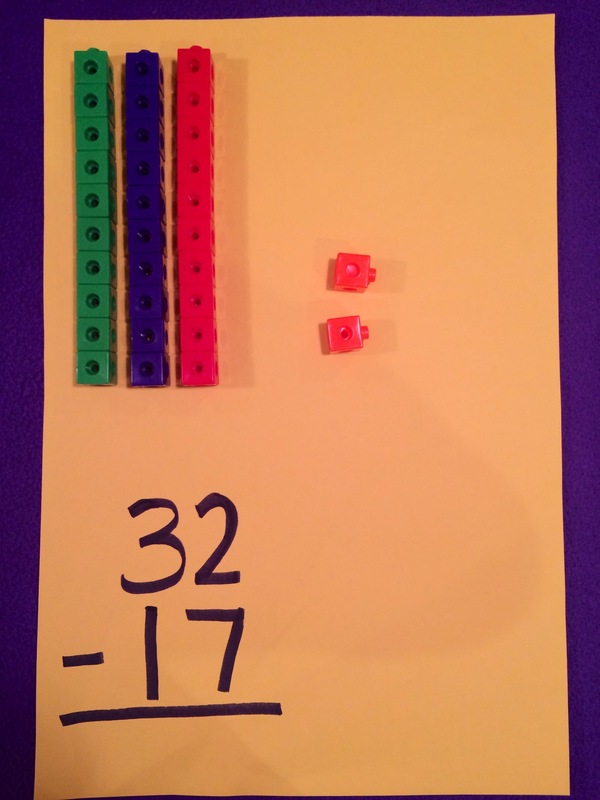 Today I was trying to teach a small group of students how to subtract with place value blocks. The problem came when I tried to show how to regroup! As soon as we traded a ten rod for ten ones, eyes glazed over and their minds left me. They couldn’t understand why we’d trade it in and pick up ten ones. I realized that is because it doesn’t really explain the concept, which is that we are breaking the ten into 10 ones, not trading. Instead I tried unifix cubes, which you can actually break apart. It was the coolest thing. Here is how we did it. 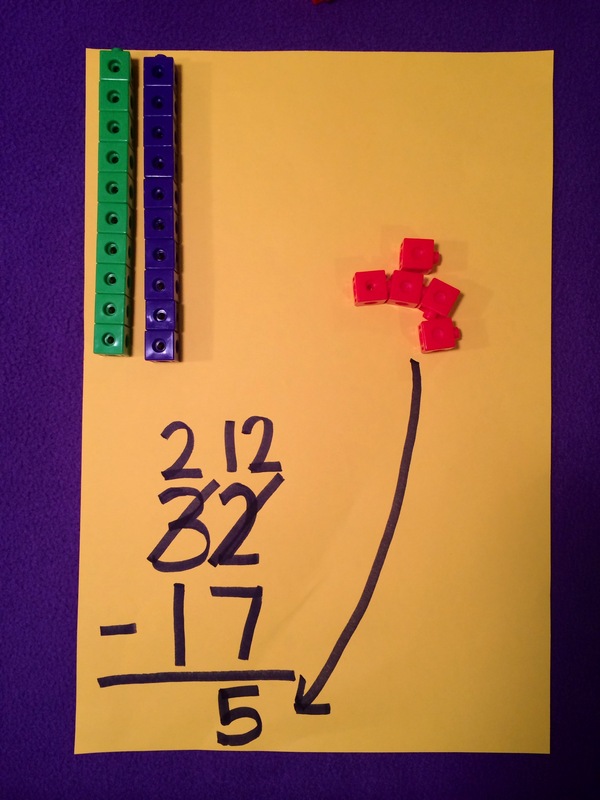 Start with your problem, but only show the top number with the place value blocks. Break that ten into ten tiny ones. Those ten ones are placed next to the two that were already there. Now we have 12 ones! We write it on the problem below to help us understand why we do that. You are left with five ones! Then, you can take one ten from the two tens. One ten and five ones remain! The best part is, teaching this way solidifies MY math and number sense. When I grew up, were were taught how to “borrow and carry” but I had absolutely NO idea why. I learned how to do this as an adult, and it was very difficult to learn. I find that when I understand math more deeply, it is easier to think of different ways to teach these concepts to students who struggle! Sometimes I feel like a magnet, with a trail of students behind me as I walk around to conference/help during work time. We are working on Open Ended Word Problem Challenges right now (I have gone through set one in the first quarter, and we are beginning set two.) These problems include a lot of reading, are many steps, and are open ended. There can be more than one right answer. So they hit the panic button right away! Right now, I am in the middle of training my students to trust themselves, to be okay with feeling a little uncomfortable. I want them to seek the answers to their problem WITHOUT me. This is very hard for them, especially when we are working on challenging math concepts. Here is what one of those problems looks like! 1. Ignore them! (What? Are you kidding? How horrible!) Of course the kind of ignoring I am talking about, is the kind where they ask for your help without trying the problem first. There is nothing worse than when you pass out a tough problem, and the hands go up immediately. This leads to my next tip, a very simple tip. 2. Make sure the students read the problem three times. Read it once to get familiar, read it a second time to zoom in to what you need to do, then read it even closer a third time to circle key details. The answer to their question is almost always in the problem. Most times I’ll read it out loud! 3. Encourage students to do what they can in the problem while they wait for help. Sitting there with a hand up, or following the teacher around, trains students that they must rely on the teacher to continue on. When I approach students my first question is always: “What parts did you understand?” They realize that they can do much more than they originally thought. 4. I teach routines when solving problems. For example, my students cannot actually get up and follow me, rather they wait as I circulate so that everyone gets equal time. Sometimes I’ll have a schedule posted where I meet with small groups. Knowing that they will all get equal time with me makes everyone relax (including me!). Teach the students that an “I can do it!” attitude is the most powerful problem solving strategy! Rounding is one of the worst things in the world to teach, right? It is classic every time. Mention rounding…kids sigh, teachers tense up and everyone’s brains feel muddled. It is HARD to understand rounding when you don’t have strong number sense. I used to teach every trick under the sun for rounding. I tried the rounding mountain, I tried the rounding coaster. I even would break it down for kids and have them underline the place, circle the number next to it, check to see if it was 5 or higher. There were SO MANY problems. Kids couldn’t figure out the place value, where to start, what to change, what to look for or even what the number was in the end. A few students would understand it, and it would stay that way. That was when I realized they weren’t understanding the concept behind the tricks. They couldn’t remember the rules of the tricks (not even when it was a rhyme, because they only memorized the rhyme and didn’t get how to use the trick). So I threw all of it away. I took down all of my rounding roller coaster and rounding mountain anchor charts. I decided to start fresh. I told my students this year to FORGET everything they ever learned about rounding. Then, we counted by tens. Not just 10, 20, 30, 40, 50 60, but also 110, 120, 130, 140, 150. We counted by hundreds in the same way. We talked about what nearest ten and hundred mean. We made number lines that counted by tens and hundreds. THEN, we began rounding numbers. It was so simple. If you are asked to round to the nearest ten, begin counting by tens by making a number line. Find the closer ten by checking how many spaces away it is from your number. As we worked with more numbers, they uncovered the mystery of the 5. “What do we do if it is in the middle? !” We round to the higher ten, because that is what the world decided to do so that everyone does it the same. We could also round to the nearest ten in numbers in the hundreds, because we practiced counting by tens in the hundreds. We can also round to the nearest hundred in this same simple way! This whole entire thing was AMAZING. After several days of practice students weren’t drawing out number lines anymore, they were able to picture them in their heads. On my pre-test I had 5 students who could round to the nearest ten and hundred. By the post-test every student except for ONE student could do it. Only one! I have been able to sit down with that student each day as he comes into school, and he’s getting it now, too. It made me realize that tricks really aren’t for kids. When students don’t understand the WHY behind the trick, the tricks don’t work. 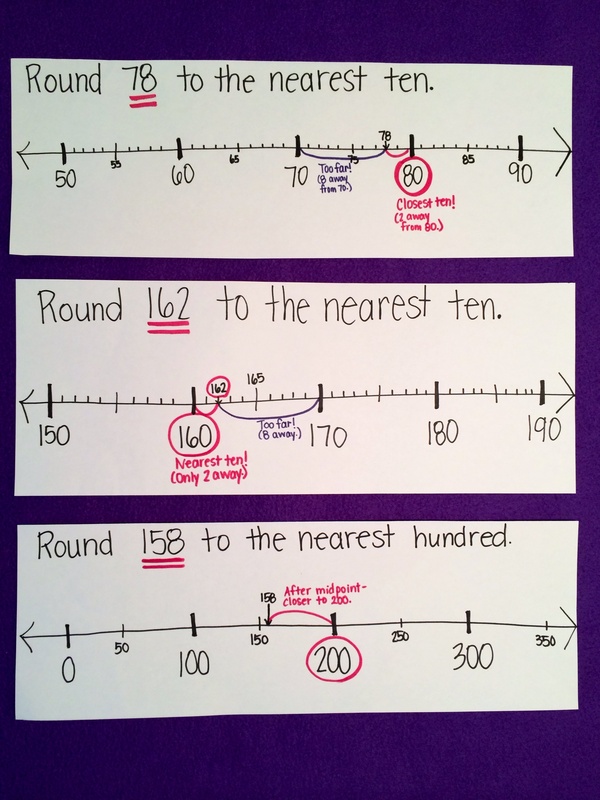 If they don’t understand the number sense behind rounding, no matter what number they underline or look at, it won’t be solid conceptual understanding, and the trick will get mixed up. I know you have the student (or maybe you have many of them) that I am about to describe. 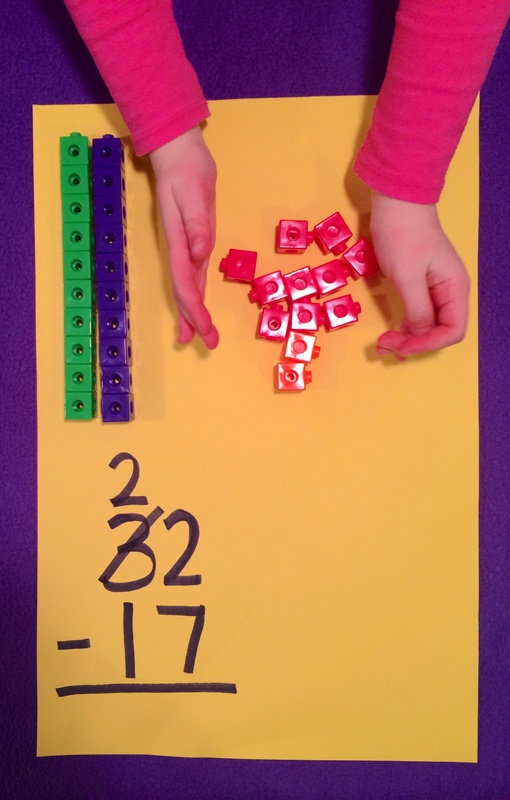 They count on their fingers as their only strategy to recall their math facts. No matter how many ways they try to learn math facts, they come very slowly. They are at least a grade level behind in math fact fluency. They feel helpless, like they will never learn their facts. There is this strange attitude with these types of students, as if they think they will never learn their facts. Their parents or siblings will say “I never really was very good at memorization, or learning my facts.” Those comments validate the student’s struggles and they feel like they, too, will never learn their facts. They CAN and they WILL learn their facts. They just need some good tools. First and foremost we must teach strategies. 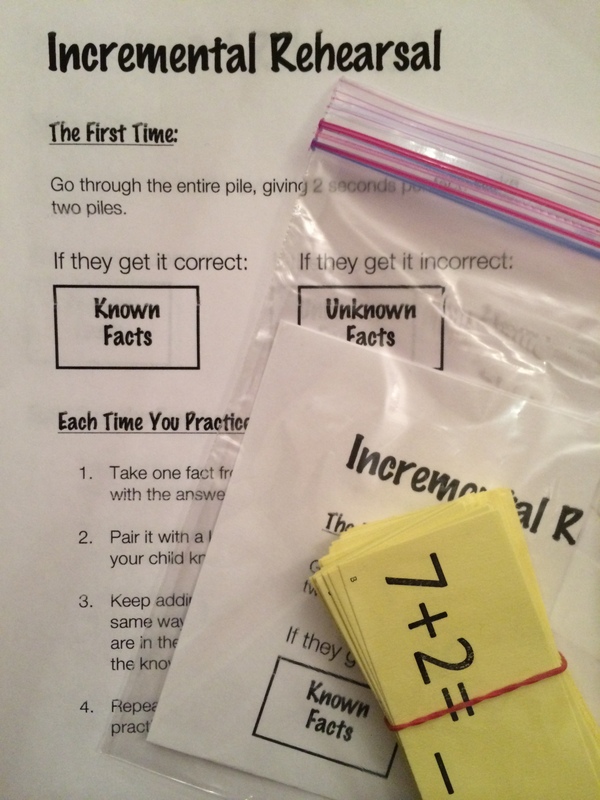 There are many ways that students can interact with their facts. They can use ten frames, number lines, fact families, pattern work etc. Time tests alone do not teach students their math facts, and we cannot rely solely on flashcards/memorization. We must first saturate their minds with a variety of ways to work with and look at their math facts. That is when memorization works, after they’ve seen the fact so many different ways they are sick of looking at it. 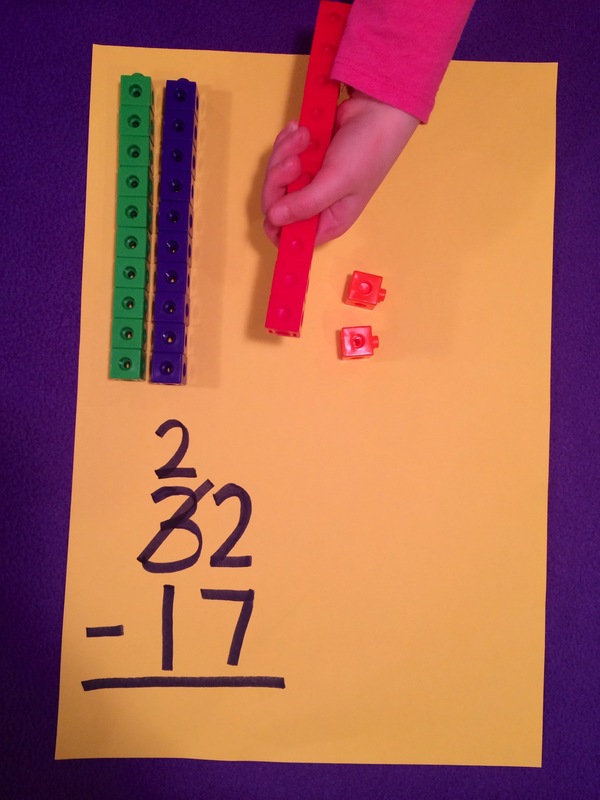 This works for the majority of students as they learn their math facts. But for some students with learning difficulties, it STILL won’t work. THEN, we must boost children up by giving them intentional memorization strategies. The strategy I am referring to is called incremental rehearsal. 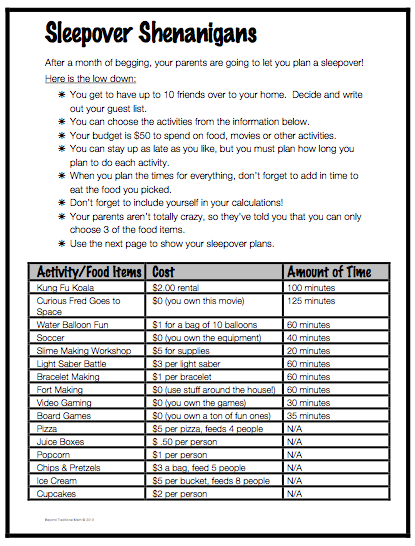 It is adapted from a strategy that I learned over at Intervention Central. Their strategy is amazing as well, but I found it was overwhelming for my struggling students to have so many facts involved (Instead of 10 but I’ve narrowed it down to 5 at a time). Parent volunteers come in to work 1 to 1 with my most needy students. I’ve worked with small groups in intervention block with specific facts. If all else fails, I’ve sent home the facts to work on in baggies with the instruction page (see below). Some students truly are going to take longer to learn the facts…but they WILL learn them. Especially if we never give up on them. Thanks to Charity Preston for the link up! 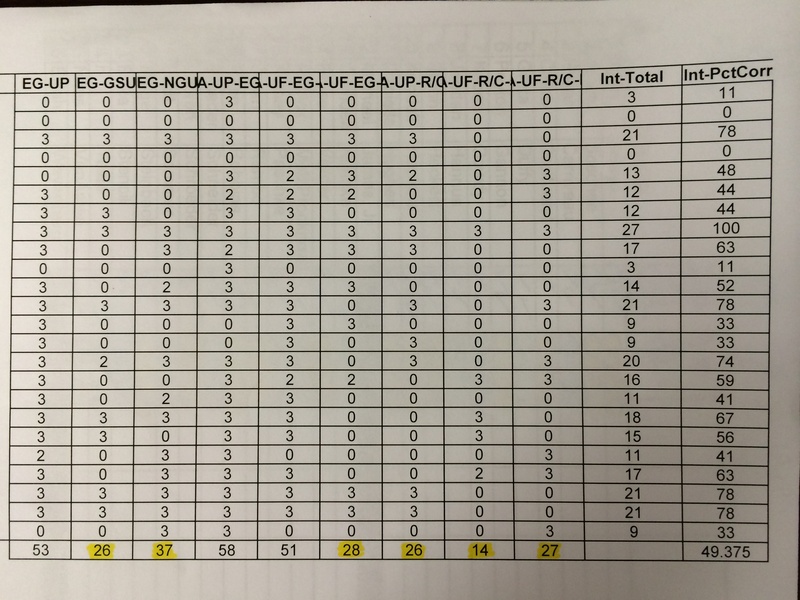 Data Doesn’t Have To Be Overwhelming! The idea of collecting data has really been getting a bad rap lately. Have you heard these comments (or comments like these) in your building? I think we’ve probably all heard some version of this at some time or another. Some of these comments might actually be true in some districts. I’ve heard horror stories about schools that are doing so much test prep, that they really aren’t finding time to intervene and help their students when they struggle. I feel lucky to work in a district that believes firmly that our data should drive instruction, and if it doesn’t, we shouldn’t collect it. I had an amazing moment about 5 minutes ago. (Yes, I was working on a Saturday night, not totally uncommon around here!) I was looking at some problem solving we did for report card purposes/parent teacher conferences (THAT explains why I’m working on a Saturday night), and I noticed something amazing. 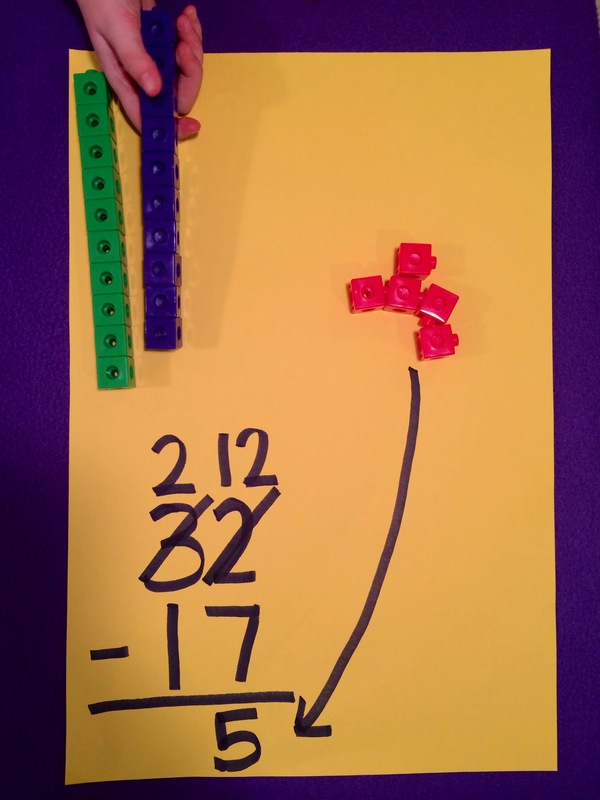 I use multiplication and division word problems in my classroom about 3 days out of the week. I am a firm believer that students need simple problems to try out before diving into difficult and complex ones. 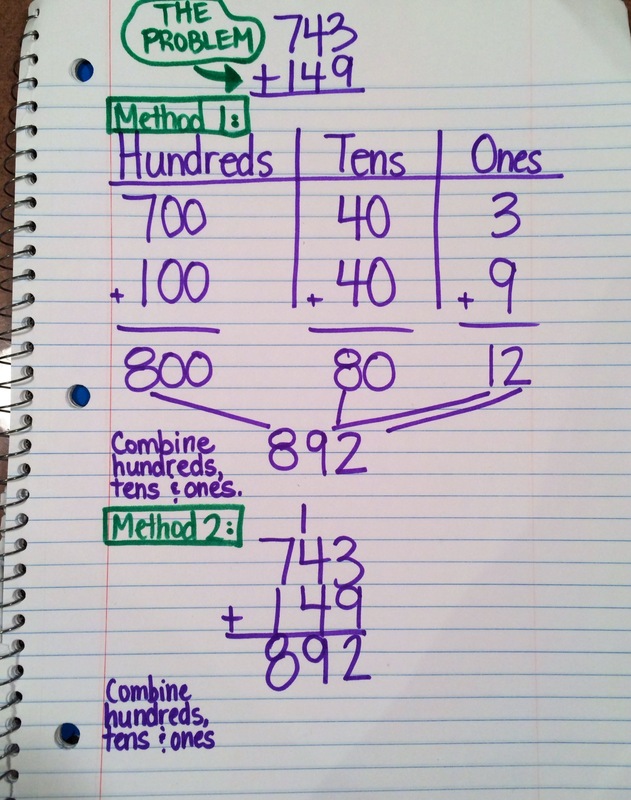 I use Practice Problems for Multiplication and Division because according to the Common Core these students must have multiplication and division mastered by the end of grade 3. There are also 9 word problem types that are broken down in the common core for students to master in grade 3 so why not teach these things together? So we practiced this problem type. We tried this type of problem five times, each time giving students a chance to come up to the chalkboard to explain their thinking. Awesome strategies were shared, and students asked many questions to see how they solved it. 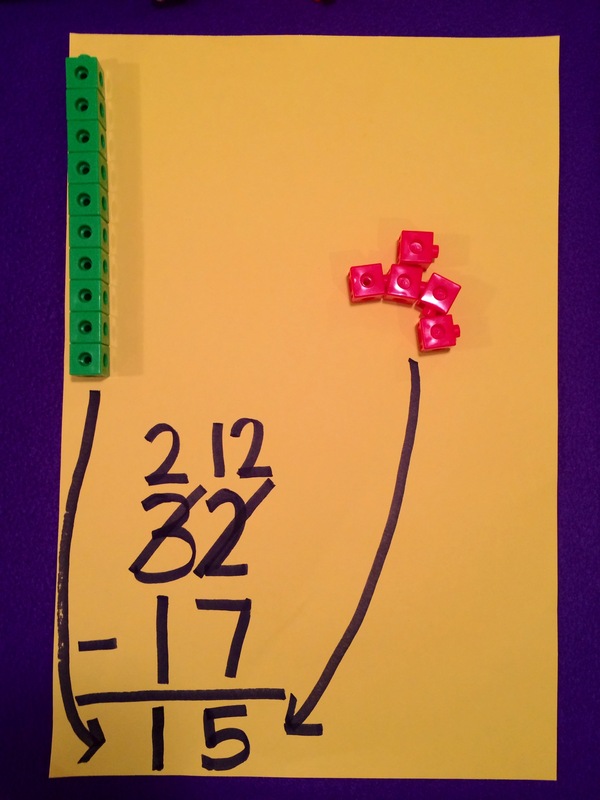 The student on the left has pretty good knowledge of multiplication, while the student on the right is just beginning. Both strategies are successful. Now we fast forward to tonight. For parent teacher conferences, I decided I wanted a sample problem solving exemplar to show to parents (it also made sense to have the latest info for report cards!). Naturally I choose this same problem type, since we’ve worked so hard on it. I just finished scoring them, and noticed that 21 out of 25 students got it right this time! I started yelling to my husband (who probably thought I was crazy) that I was so proud and excited for my students. I can’t wait to share this awesome news with my class. I am hoping celebrating our success will motivate them to continue to work hard. I know that differentiation is SO important. I know it is the right thing to do. But sometimes it is SO difficult to make sure I am meeting the needs of all learners. Right now we’re plugging away with the concept of regrouping when adding 3 digit numbers. There is a group of 6 students in my class who’ve gone BEYOND mastering that concept. I know that I can’t spend an extra day with their bored faces staring up at me. I just can’t take it, and I know in my heart it isn’t right to continue whole group teaching when they need the support of a higher level thinking challenge. So…meet Open Ended Problems! I’ve used them before when students have mastered content, these problems get them thinking and are REALLY challenging and complex. Great, right? Well today something went wrong. In a perfect world, I’m instructing the students who are struggling with adding/regrouping as a whole group, while the other students are working on the open ended challenge at their desk. That didn’t happen today. 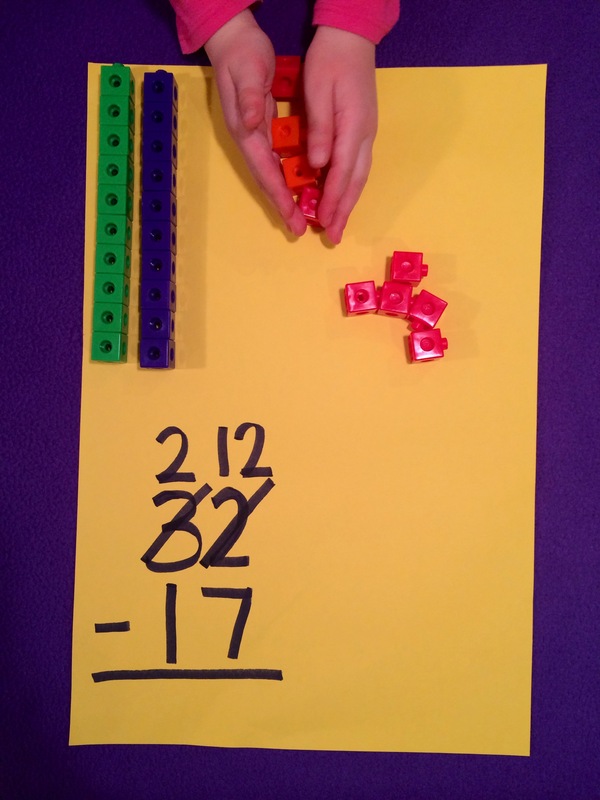 The students who were struggling with adding/regrouping were frustrated…and the students working with the open ended challenges were frustrated. Everyone in the room at some point had red cheeks, tears in their eyes at times, scrunched up faces, and a general lack of unease. Why the frustration? What was happening?! I realized that while I was working with my group, we were being interrupted by the students who were working on the open ended challenges. They weren’t coming up all at once, rather, they were coming up one at a time, every minute or so, interrupting the thought process of the group. They weren’t interrupting to be rude, they simply ran into a problem while they were working, and came to ask me what to do. That was when it hit me that we are sorely lacking in the Math Practice Standard 1: I can make sense of problems and persevere in solving them. Instead of making sense of the problem, those 6 student’s first course of action were to come straight to the teacher. Not used to feeling challenged, they were “stuck” because they are used to answers coming quickly. They weren’t used to having to read the problem more than once, and didn’t even realize that their questions that they asked were answered RIGHT in the problem they hand in their hands. After about 5 minutes of these interruptions, I explained to the group of students working on the challenges that they would be meeting with me in 15 minutes. Once they knew this was coming, the tension in the room released. ALL of the students began to breathe and feel more comfortable. That simple gesture of letting them know that they’d get their time with me was the solution. The students in front of me relaxed, the students at their desks relaxed and we were able to go on with our work. By the time I got to that group of 6 students, most of them had figured out the answers to the questions they had! Sometimes, differentiation feels impossible. It is difficult, but it is RIGHT. Everyone in the room had a challenging task, and that is how it should be. Now, I’ve just got to reteach and work on my expectations and routines for small group work. Differentiation looks different in all subject areas, but I find it to be the MOST challenging during math. How do you differentiate and hold students accountable? 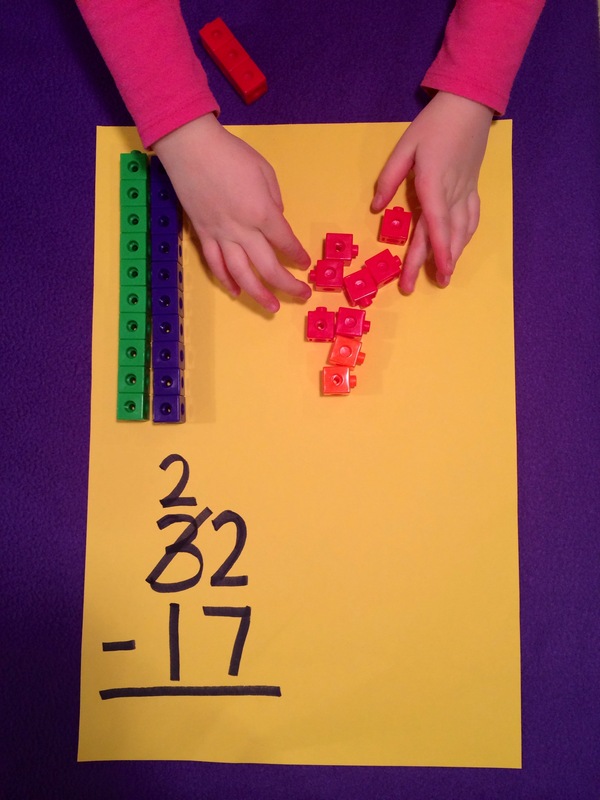 Do you do centers, or a math workshop style? I would love to hear suggestions, comments, questions and more! The more we share the more we learn.